By Travis - Turkey - 13 Oct/03 - Viewed 1608 times. We left Rhodes Tuesday afternoon on a hydrofoil to the Mediterranean resort town of Fethiye on Turkey's southern coast. It was dark by the time we arrived (this is becoming a pattern), and we didn't have a guidebook to direct us in this town. We got off to a good start by finding an ATM right away, and our hot streak continued by running into a man who spoke English and was able to direct us to an inexpensive, clean hotel. Later that evening we had a wonderful meal for 8,000,000 Turkish Lira (about $6.50) and got some information about local attractions. The reason we had chosen to enter Turkey at Fethiye was a photo we had seen of Saklikent Gorge, so we took a minibus there first thing Wednesday morning. We were taken on the scenic route, lasting an hour and a half, through small villages and along fields where the cotton was being harvested by hand. We arrived at the entrance to the gorge, where the river emerged from the crevice and flowed into an open valley. There were several restaurants set up along the river bank, having wooden decks hanging out over the water with seating cushions placed around low-rising tables. The first 200 meters of the hike into the gorge was along a wooden walkway attached to one side of the cliff. At the end of the walkway was a more open area of the gorge where half a dozen springs gushed from the side of the cliff, greatly increasing the flow of the river and markedly decreasing its temperature. This area was also the end of the walkway, and we traded in our hiking boots for black, rubber wading booties. The rest of the forty-five minute hike was in the riverbed, where the water ranged from ankle deep to waist deep. The gorge narrowed to my wingspan in some areas, and was over fifty meters high. When we returned the Fethiye later that afternoon, we walked to the base of the cliff which bordered the northern edge of the town. There were Fourth Century B.C. Lycean tombs carved into the cliff in several areas. All of the stone doors to the tombs had been broken open, the burial contents replaced with trash, but the artistry of the tomb facades remained. On Thursday we took another minibus from Fethiye to an abandoned town named Kaya Koy. When Turkey became a Republic in 1923, it arranged a population exchange with Greece to bring the Turks living there back to Turkey. Before then, Kaya Koy had been populated totally by Greeks, who packed up all of their belongings and were relocated to one of the Greek islands. The Turks who had been assigned to relocate to Kaya Koy were farmers, and chose not to move into Kaya Koy which was set on a steep hillside with no farmland in the immediate area. So, Kaya Koy has been a ghost town for the past 80 years. All of the wooden roofs, floors, doors, etc. have rotted away, leaving just the masonry shells of the buildings which are now being turned to rubble by weather and vegetation. It had a very eerie feeling. Also, it gave some perspective to the deterioration of the various ancient ruins that we had recently visited, to see nature going about reclaiming this town over a relatively short span of time. We came across some tourist information indicating that it was possible to hike from Kaya Koy, up over the nearby ridge, and down the other side to the picture-postcard beach of Oludeniz. During our tour of the abandoned city, we saw a trailmarker for Oludeniz and started off in that direction. An hour later we arrived at a very picturesque beach, just not the one we had seen on the postcards. The owner of a little restaurant at the end of the inlet told us that we had made the proverbial "wrong turn at Albequerque" and were now a good three hour hike from Oludeniz. This convinced us to eat at his restaurant (which turned out to be outrageously overpriced, even considering that its remote location necessitated all of the supplies, and 90% of his customers, to be brought in by boat). After lunch we hiked back over the ridge to Kaya Koy, discovered where we had made the wrong turn and made the walk to Oludeniz in about two hours. Other than the disgraceful amounts of trash along the beach, Oludeniz was just as spectacular in person as in all of the postcards we have seen. The view we had from the ridge as we hiked down was especially nice. As we relaxed on the beach, we got into a little tussle trying to see who could put more sand down the back of the other one's shorts. By the end of the contest we were making quite a scene for everyone to enjoy. We missed the last bus to Denizi that evening by five minutes, so we opted for the overnight bus to Sel�uk. We arrived at 5:15 the next morning, and not even the bus station was open for us to get in from the cold (we could clearly see our breath). After walking a few blocks without finding shelter, we found a hotel with the lobby door unlocked and the nightwatchman asleep on the couch with the TV running. Knowing that we weren't going to stay the night in Sel�uk and not wanting to have to get a room for just a couple hours until the sun came up, we quietly opened the door, tip-toed past the watchman and into the lobby. When he woke up at 6:45, we used the confusion of the language barrier to our advantage and left with no harm done. We arrived at the ruins of Ephesus just outside of Sel�uk just as they were opening the gates. The sun was still behind the hill to the east of most of ruins, so we quickly walked through to the other end of the ancient city to warm up in the sun. At about this time, sevaral large tour groups arrived at the sunny end of the site but we were able to stay ahead of them and get some nice photos of the ruins. It's easy to believe the claims that Ephesus is the most complete Greco-Roman archeological site in the Mediterranean, with everything from the famous Library of Celsus to the public latrines to monuments dedicated to Roman Emperors to working class homes to an amphitheater with a seating capacity of 25,000. While waiting for a minibus back to Sel�uk, we struck up a conversation with a local man who spoke excellent English. After about ten minutes, he indicated that his family owned a Turkish carpet store in the town. We talked about the different types of materials, designs, etc. He eventually asked us if he could give us a ride back to Sel�uk and show some to us. We declined, saying that we were not in the market for a carpet just then, but he persisted and we relented. The carpets were beautiful, and I was amazed at the variety of styles and the labor involved in creating them (and the prices). Ultimately, we declined to buy one, but it was an enjoyable half hour lesson. We had a four hour bus ride from Sel�uk to Pamukkale, with another impressive set of Greco-Roman ruins. But of even greater interest to us than the ruins were the giant travertine terraces covering over two kilometers of hillside in length and approximately 100 meters in height. These terraces are created when calcite in the water emerging from the hot springs falls out of suspension as the water cools and makes deposits, in the manner that stalagtites are formed in caves. The travertines are in pretty bad shape from a combination of local hotels draining off the water for use in their pools and spas and from contamination from thousands of daily visitors during the tourist season. The government instiuted some restrictions about five years ago which have helped, but old photographs reveal the drastic effects of development in the area. We took an overnight bus that evening to Cappadocia, a region in the center of the country that is famous for its bizzare landscapes and early communities that adapted to those conditions. We arrived early Saturday morning in Goreme, checked into a hotel and slept for a few hours (back to back overnight bus rides turned out to be a mistake). We spent the remainder of Saturday touring the Goreme Open Air Museum and the surrounding area. This museum consits of an early Christian seminary, where the lecture areas, chapels and "dormitories" were carved into the soft volcanic rock that make up the cliffs and small peaks throughout the valley. These small peaks were from 20 to 100 meters tall, and look like the giant termite nests made out of mud and found in Africa (as seen on the Discovery Channel). After checking out the museum grounds, we were walking back to town and took a detour over a ridge on the opposite side of the road from the museum where we found another set of houses carved into the rocks. We made our way to the bottom of the gorge, the wider areas of which were currently being used to grow tomatoes, grapes and fruit trees. In a couple of spots the gorge came to an end, but the trail continued on through tunnels carved through the rock centuries before--one of the tunnels was over a hundred feet long (we were glad we had a flashlight with us). The following day we joined a small tour group to visit several sites in the area. The first was an underground city (one of a dozen or so in the Cappadocia region), first developed by the Hittites as temporary quarters when their above-ground cities came under attack and later used by persecuted Christians. The city was eight levels deep, and could house 10,000 people for up to a month at a time. The first level included stables (the animals lived in there year around, as they could not be moved in quickly enough during an attack), a winery, and food storage areas (which were also used year around because the temperature preserved the food). The second level included communal kitchens that had chimneys leading to an enclosed smoke room on the top level--the volcanic rock is porous and absorbed over half of the smoke and slowly released the remainder so the location of the underground cities would not be given away. Most of the lower levels were housing units, and the bottom level included a church and common areas. We visited over twenty rooms, but only 15% of this city has been excavated and opened for tourism. The next stop on the tour was an hour and half trek through the Ilhara Canyon. 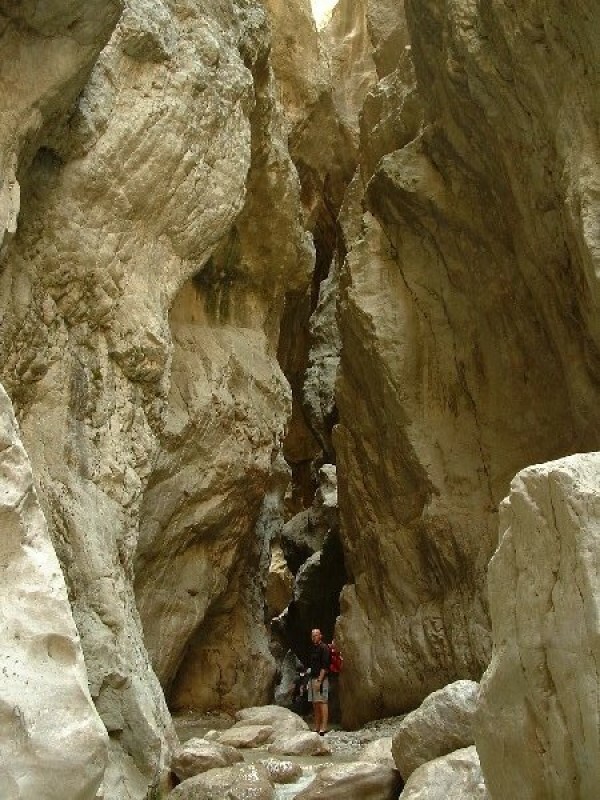 It wasn't as narrow or as dramatic as Saklikent Gorge (which we visited earlier in the week), but the canyon walls had numerous dwellings carved into them, along with a couple of monasteries. One of the monastaries, which was built over several centuries, had different aspects of architecture and decoration indicative of styles before and after Christianity was split into Roman Catholic and Eastern Orthodox. After the canyon, we visited a karavanseria--one of the fortresses located every forty kilometers along the Silk Road throughout Turkey. They were built by the Ottoman Empire in the 13th Century to provide a safe haven from thieves for the caravans travelling from China to Europe, and the caravans could stay up to three nights at each one for free, including two meals a day for the men and their camels. The last major stop of the tour was a town ten kilometers north of Goreme, known for its pottery tradition. This particular shop had been in operation for four generations. We had a demonstration of a cermic plate being molded, a pot being thrown on a pottery wheel, and the pieces being painted. When it came time for volunteers on the pottery wheel, Abi was ready to go. She was a good sport, but I don't think she'll be throwing clay for a living any time soon. We spent most of today travelling by bus from Goreme to Ankara, the capitol of Turkey. As we approached the capitol and saw it sprawling across the rolling hills from one edge of the horizon to the other, with heavy smog hanging above, we decided to keep going. We switched buses, and in another three hours we arrived at Eskeseshir, the city known as the place where meerschaum is mined and the world-famous pipes are hand carved (such a pipe is on my list of souveniers for the trip). The town has virutally no tourist trade (at least not that we have encountered), and we are relying on our Berlitz phrasebook more than ever, which is fun in its own frustrating sort of way. We will head to Istanbul tomorrow.